Watching Olbermann Watch: Robert Cox attempting to professionalize blogging and create a (right-wing) blogging elite? 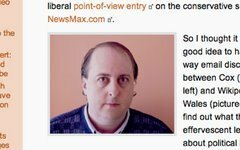 Robert Cox attempting to professionalize blogging and create a (right-wing) blogging elite? The real story behind the ‘Maine Blogger’ story is that this blogstorm did not just ‘happen’. I personally spent several weeks developing a media strategy which we launched last Thursday morning. The original goal was to get the story in front of 3-4 mm people by Friday night. We easily surpassed that figure and the number continues to grow. Once we were ready to drop the story, I reached out to the Members of the Media Bloggers Association with an ‘MBA Legal Alert’ and they responded in force. Hundreds of bloggers responded to the MBA’s request to post this story and make their readership aware of what was happening in Maine. We also sent out a traditional press release to our ‘press list’ and added in about 100 Maine/Travel media outlets – that’s how the Globe got the story. Once the ball was rolling lots of other folks got behind the effort and Lance was a full-fledged bloglebrity. This kind of blog/MSM media strategy is part of the two-pronged approach we take as part of our Legal Defense Initiative. I think the real story is that this strategy can be – and has been – so effective. And I agree – it can be, and has been, so effective. But… it’s important to realize just how old-school top-down this is structurally. In fact, scarily so. Work with people who have big megaphones, get them to echo the story, then go up the media pyramid. It’s extremely traditional. Now, the powers here were used for good instead of evil. But, still, what if it were the reverse?" The extreme right requires a culture war. Doesn’t it sound as if the right-wing MBA were providing that culture war against the mainstream media? The right-wing Media Bloggers Association did not rely on the U.S. justice system alone to prove the legitimacy of its case. It orchestrated a carefully planned media campaign. Is this professional? Is this elitist as only MBA members have access to these legal and PR resources? What does it mean for bloggers to be professionalized? What does it mean to have an elite tier of bloggers covering national events? To become a credentialed member of the MBA, one must now pay membership dues. This sounds pretty professional. The MBA has board meetings. This sounds pretty professional. Much like the board meetings of large corporations, the board meetings provide public records – creating a distinction between those who are “in” the group and those who are “out” of the group. Isn’t this in-group/out-group mentality a characteristic of fascist/authoritarian social systems? In addition to having two seats reserved for member bloggers at the Libby trial, the MBA also has access to exclusive events reserved for “electronic journalism professionals.” This sounds pretty professional. PBS is apparently interested in the thoughts of MBA bloggers on business models and how those bloggers will be providing the news. This is not how citizen journalists will provide news, but rather how MBA members will provide the news. Elitist? Is the right-wing Media Bloggers Association elitist? Is it attempting to professionalize a medium that has grown as a direct result of its egalitarian basis?